Marvel Collector Corps is a subscription box that sends out exclusives toys and collectibles from Funko/Marvel. 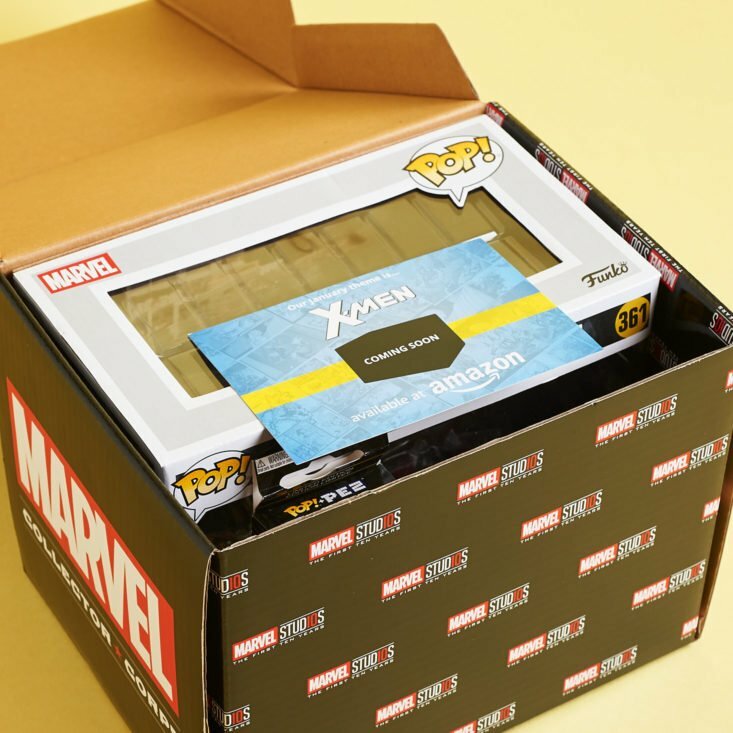 This box ships bi-monthly and always has a theme – this month is a special one, it features items from the first 10 years of the Marvel Cinematic Universe. 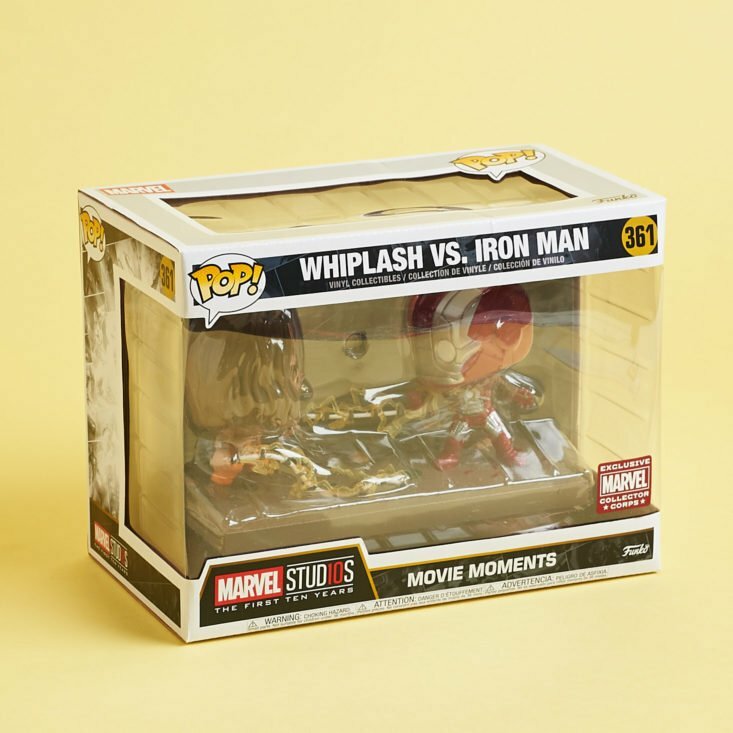 Funko has been celebrating the 10-year anniversary of the Marvel Cinematic Universe with a bunch of gold-plated POP designs – so I was excited to see how they’d extend that to this box. I was really excited to see the return of the information card – which even includes the concept art that I loved from their original boxes. The big-ticket item of this box is a Movie Moment – which completely makes sense considering the theme – and it feels like it’s one that probably wouldn’t have seen mass-production, which make me like it even more. This is from Iron Man 2 – released before Funko really blew up – so it’s fun to see it return and Funko-ize the movie scene at the racetrack. I love that Whiplash has that toothpick and that Iron Man’s suit has the charred battle-damage look. Overall, I really like this one – which was a tad bit of a surprise since Iron Man 2, and Whiplash wasn’t even close to my favorite moments in the Marvel Cinematic Universe. I mentioned earlier that Funko was gold-plating a ton of Marvel items in their lines, and here we get our first glimpse of that. Gladiator Hulk gets the gold treatment – what better way to eat some Pez? Funko’s more recent line, Pint Size Heroes, gets two items this month. Typically, these are mystery bags, but for these subscription boxes, everyone gets the same items. You shouldn’t have a Cinematic Universe box without Thanos – so the biggest bad guy of them all gets the smallest toy. Thor also makes his first (and only) appearance with this item. Verdict: I love the Funko Movie Moments vinyl line – so I’m going to be a bit partial to this box. For $30 – you’re mostly just paying for the Movie Moments POP and getting these other items as a bonus. I also am a bit partial towards these tiny little Pint Size Heroes (and I totally ate the Pez) – so, all in all, I was a fan of this theme. What did you think of the Marvel Studios: The First 10 Years Collector Corps box?